Welden & Coluccio Lawyers is proud to announce they are again partnering with the Ice Factor Spectacular as gold sponsors, helping to keep “at-risk” kids in schools through ice hockey. Welden & Coluccio Principal Jason Coluccio said keeping kids in the classroom is more important than ever. “Low-skilled jobs are disappearing and stable employment is getting harder to find, so the next generation will need to be adaptable and show they can take on new challenges with ease,” Mr Coluccio said. “In a sporting-mad nation, Ice Hockey is a great way to test out young people, because the game is largely alien to us. “It’s a great leveller – no matter how good a kid might be at footy or cricket, that soon goes out the window when you put them in ice-skates for the first time. “That experience humbles students, forces them to work together as they build a new skill in a fast and exciting game,” Mr Coluccio said. Welden & Coluccio Principal Greg Welden agreed, saying his own experiences playing sport at school helped lay the foundation for a successful career. “Hope and confidence are the most important gifts you can give a young person. A little bit of hope at the right time can change someone’s life,” Mr Welden said. “Forcing kids to stay in school only builds resentment, but if you give kids a reason to believe in their own abilities and show them the possibilities school can open up, it becomes a whole new game. “You can literally see the Ice Factor transform young people, from their first nervous push onto the ice, to lightning fast runs at goal, that on-rink development transfers to the classroom,” Mr Welden said. While there is considerable emphasis on teaching the skills of ice hockey, the students are also given tasks to help in the development of literacy and numeracy skills, including team management, keeping statistics, producing a newsletter, fundraising, and developing promotional material are designed to teach the students vocational skills, while also adding to the sustainability of the program. “Welden & Coluccio are proud to support this incredible program and help give back to the city that made us the people we are today,” Mr Coluccio said. 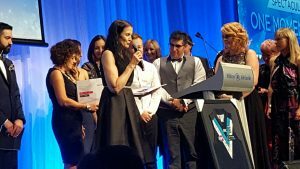 *Welden & Coluccio Lawyers is a specialist Wills and Estates firm, recognised by Doyle’s Guide and twice finalists in the Telstra Small Business Awards. Both raised in working class families in suburban Adelaide, Greg and Jason are proud to support grass roots initiatives to help empower at-risk youth in the community.